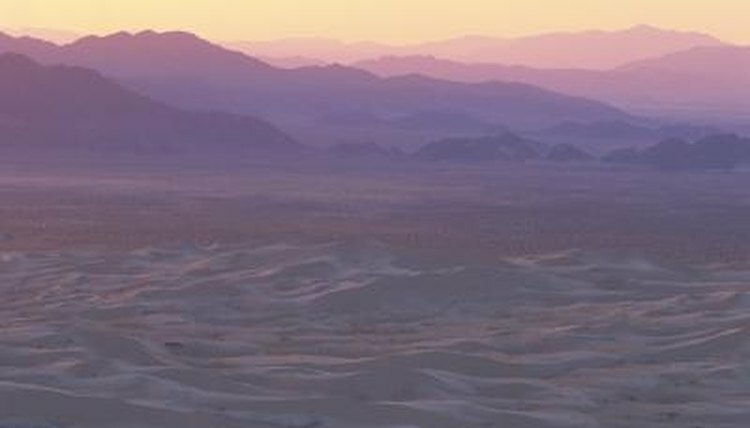 The Mojave Desert makes for a suitable locale for a wide array of different reptile species, from lizards to snakes. This classic dry and arid desert environment spans portions of California, Utah, Arizona and Nevada. The California kingsnake is just a single example of a Mojave Desert resident. The sidewinder (Crotalus cerastes) is a Mojave Desert snake that typically has a beige, yellow pink coloration. These solitary reptiles are not only common throughout the Mojave, but also in the Sonoran Desert. The lizard-eating creatures frequent dry desert settings, but are also prevalent in flatlands, gravelly, rugged regions and sand dunes. Fully mature sidewinders grow roughly 30 inches long, and females are generally the bigger of the genders. The glossy snake (Arizona elegans) is a terrestrial reptile of moderate physicality. Glossy snakes are usually gray, pink or cream with conspicuous darker blots. These burrowers are abundant all over the Mojave Desert, and although they are especially common in deserts, they also live in other habitats such as grasslands, chaparral slopes and rugged washes. Glossy snakes usually are underground, out of human sight. These diurnal animals can grow as long as 42 inches. The Mojave rattlesnake (Crotalus scutulatus) is a sizable species of snake that, as its name conveys, often resides in the Mojave Desert. These brownish-gray, olive or beige snakes are a common sight in elevated desert settings, although they are also prevalent in foothills and low valleys. For the most part, Mojave rattlesnakes lead nocturnal lifestyles. Since they are venomous, it's smart to keep your distance from them. Mojave rattlesnakes grow upwards of 50 inches in length. The gopher snake (Pituophis catenifer) is a slender-necked creature of pretty impressive length -- usually between 70 and 108 inches or so. They are the longest snake species in all of Arizona, according to Reptiles of Arizona. Outside of the Mojave Desert, gopher snakes also often live in shrublands, prairies, foothills and sand dunes. They also frequent agricultural sites. These constrictors do not produce venom. What Dangerous Snakes Are in France?